I’m pleased to announce the launch of TankardStore.ie. 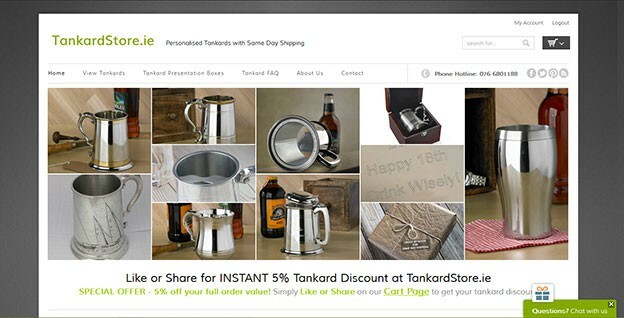 TankardStore is my second Irish targeted website for Gifts-Of-Distinction following on from the very successful FlaskStore.ie which was launched in 2015. TankardStore.ie is an E-commerce website with social media marketing as standard! TankardStore.ie offers top quality tankards to the Irish market, specialising in Personalisation and Engraving, with a guarantee of swift delivery. In fact, TankardStore hand-make, engrave and ship tankards the same day for orders placed before noon. Customers can ask questions in real time via Live Chat. Out of business hours customers can leave a message using the chat system. The site offers instant discounts to customers who share or like the site on social media. As a courtesy and for ease of use customers can also register and log into the site via their FaceBook or Twitter accounts. Customers are not required to register and can purchase their tankard as a guest customer should they so wish. The site also features the use of promotional discount coupon codes offering anything from cart discounts to free shipping. To help spread the word new products and news posts are automatically published to FaceBook and Twitter. This entry was posted in Work Life and tagged E-commerce Websites, Facebook, FlaskStore.ie, Gifts-Of-Distinction.co.uk, Irish Website Development, Social Login, Social Media Marketing, TankardStore.ie, twitter, Viral Coupons, Website Live Chat on January 11, 2016 by admin.